The Baltimore Taxi Fare Card is a branded card service that offers companies in the Baltimore area a simple yet elegant solution for their transportation needs. The Baltimore Taxi Fare Card allows your employees and customers to take advantage of our independently owned and operated fleet while simplifying your bookkeeping by replacing paper vouchers, coupons and credit card receipts with a simple online portal. You can control when and how often your employees use company reimbursed transportation and get real-time updates on transportation usage. Trips can also be categorized by client to simplify your own billing. Supercharge your trade shows and conventions by sending a Baltimore Taxi Fare Card with your company’s logo to potential clients. We can print your logo and your booth location on the card, and you can send the cards to convention goers to bring them in from the airport, to get them from the hotel to the convention center, or to give them free transportation for the entire week. You decide the benefits; we program the cards to suit your needs. 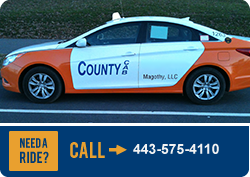 The Baltimore Taxi Fare Card can be used for any County Cab as well as any of our affiliate fleets: Arrow Cab, AA Cab Connection, and Baltimore City Taxi. For more information, register below or call Ron Pretlow at 443-575-4109, Option 4, Monday through Friday 8:00 a.m.-3:30 p.m.